Our grade 8 students are currently in the middle of large-scale study, combining both the Worldview and Renaissance components of the Social Studies curriculum. This study contains two sections, first the creation of a worldview survey, and then a study on the Renaissance, comparing the Italian City States to the conditions in contemporary Calgary. To help with the first component, we've had few experts participate in the study, bringing the element of authenticity into the work. A few weeks ago our students Skyped with Wes Fryer, who informed us of some of the recent changes in networking technology, and how they are changing the way information is accessed and shared. We had another guest speaker in a few weeks ago, Rob Pegg, who's one of the parents at our school and also a web designer. In his own line of work, Rob has often designed and implemented surveys, and so the teachers asked him to come speak, providing the students with a number of elements to consider when putting together an effective and unbiased survey. After listening to Rob, the students discovered that making survey questions that pull out someone's worldview is very difficult. There are so many factors that influence someone's view of the world, and also the students found it challenging to make 'objective' survey questions that highlighted the key elements of someone's worldview, without being vague, general or leading. After collaboratively writing the questions, we put the first version of the survey into Survey Monkey, and have since had our grade 9 students test the survey. Also, Survey Monkey has the feature of allowing comments on individual questions, so we asked two classes of grade 9s (who had just finished a math unit on surveys) to provide feedback on all the questions. The grade 9s were able apply the content they recently covered (on topics such as 'question bias', 'answer bias' and 'leading questions') to give focused feedback to the grade 8s on their questions. The grade 8 are currently revising the questionnaire, and will be releasing it publicly in the new year - hoping to receive as many responses as they can from around the globe. 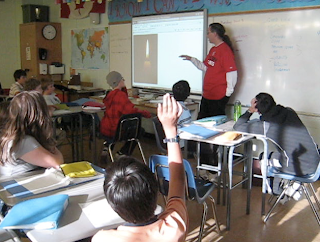 One of our grade 7 Humanities teachers, Dan McWilliam, just finished a project with his grade 7 students. In order to understand the concept of perspective in historical accounts, Dan had his students re-write a 'picture book' on colonialization from an alternate perspective. Dan used the book "The Rabbits," written by John Marsden and illustrated by Shaun Tan. "The Rabbits" is an incredible visual story of a group of rabbits (the colonizers) who arrive in a new land, spreading their worldview over the native marsupials who reside there. The art work is stunning, and weaves in fantastic imagery of western philosophy and expansionism. The original book,"The Rabbits" is told from the point of view of the native marsupials, and so Dan wanted his students to explore the motivations of the colonizing rabbits, so he had his students retell the story from their alternate perspective. Working in pairs, the students were each assignment one page out of the original book. Students then had to imagine how the events on the particular page might be retold from the perspective of the colonizers, rather than the 'natives.' Dan scanned pages from the original book, and the students remixed pieces with other images they found. The students used Abode Firework to create the new pages, and then Dan assembled the pages, and had one book published from each of his two classes. Through the re-telling of the story, both from the rabbits' perspective, as well as through the lens of Canadian History, the students included historical details relating to the fur trade, the signing of land treaties and residential schools. The students creatively used historical images from events in Canadian history, and using Fireworks, replaced the heads of the characters with the heads of rabbits and marsupials. In doing so, the students were able to weave in historical understanding and demonstrate an ability to retell historical events from alternative perspectives. Every year at this time, our school community comes together around an event called Peace Festival. Peace Festival started many years ago as a way to celebrate the multicultural make-up of our student body. It was also a way to focus our entire school population (teachers, students and admin) around topics of human rights, global awareness and the difficult living conditions of many people around our city, country and the world. Some of our grade 6 students have recently finished a large scale writing project, called the Penny Book project. This project involves students writing a series of short stories, capturing memories from different years of their lives. The students have just finished all the planning, writing, editing and polishing of the stories, and the next step is to get their writing ready for printing. To do this the students are going to be introduced to the basics of graphic design and page layouts. To get the students creating effective page layouts for their stories, we're using a two-step process. Last week, our grade 8 students had the good fortune of having an hour and a half skype chat with Wes Fryer, an educational thinker and blogger from Oklahoma. Wes was very generous with his time - and we were very thankful for the opportunity to chat with him. Our students are currently working on a project combining both the 'Worldview' and 'Renaissance' elements of the grade 8 curriculum. During our skype chat, Wes was able to assist our students' thinking about the changing role that technology plays in the spread of ideas. He also provided some suggestions about particular websites and 'marketing' techniques that our students should consider to help their survey find a wider audience.